Much of Ryan’s artistic drive comes from a deep-seeded love of new experiences. He believes strongly that alternative ways of thinking inevitably lead to original creations, and he is the author of many unique and creative musical expressions. This has been the driving force behind Ryan’s musical career, which also compelled him to earn degrees in piano performance and music composition. He has worked as an organist/instrumentalist in churches for 16 years and has has been at the Pine Street Church since 2008. Each time we gather for worship, Ryan provides us with an eclectic serving of musical experiences, ones ranging all the way from the expected classics, but which include the likes of Scott Joplin on the piano, all the way to his very own improvisations on organ, piano, and synthesizer. Additionally, he is a frequent guest performer in the community from choral events to contemporary musicals. A devoted father and husband, Ryan lives in Lafayette, CO with his wife Annie and their two children, Alex and Lyra. Email Ryan. ​Andrew’s pastoral leadership experience began early in his career in a two-year Pastoral Resident Program at Wilshire Baptist Church, Dallas, a wonderful church known as an excellent training ground for exceptionally talented young pastors (2004-06). Moving from Dallas to start a new church, Christ Church in Rockwell, TX, provided additional opportunities to grow in pastoral skills and perspectives as the founding pastor (2006-10). As the Minister of Faith Formation for the Myers Park Baptist Church, Charlotte, NC, he served as the senior spiritual educator of a 2,100 member ecumenical church. Preaching regularly and developing a multi-disciplinary network of small groups was Andrew’s special focus at the Myers Park church (2010-13). Four years ago Andrew was called to join the staff of Calvary Baptist Church of Denver. He has shared in the leadership of Calvary with his friend and colleague, Rev. Anne Scalfaro. Andrew is also involved and engaged in matters of faith on a national level. He is a National Board Member of the Baptist Joint Committee for Religious Liberty, Washington, DC. He is also a Contributing Religion Blogger for the Huffington Post, New York, NY. Andrew is a single parent of two beautiful children who are the center of his life. All know him as a devoted father to daughter, Addison(8), and son, Aidan(6). Andrew enjoys writing, reading, trying new restaurants, Denver Broncos football, Chicago Cubs baseball, and anything that involves his two young children. Email Andrew. Guillermo is our caring and loving sexton and ministry assistant. He is an insightful and gentle soul who's passion revolves around a ministry of reconciliation and helping those in need of emotional and spiritual support. He has come from Puerto Rico to serve in our community and to help us expand awareness in the areas of diversity and inclusivity. His bi-cultural experience and inter-faith training gives him the ability to see God in everyday life and the human connection. Having earned his bachelors degree in Latin America History, Urban Studies and Cultural Geography, Guillermo possesses perspective on diverse cultural experiences. He is also currently working on his master of divinity at Naropa University, which gives him the opportunity to integrate his spirituality with his training. With practices of mindfulness and meditation, Guillermo helps our visiting college students and young adults to unfold in their spiritual process. The driving force behind David's passion for music is that at its core it is inherently a spiritual experience. David firmly believes that music has the capacity to enhance the meaning and impact of every message or lesson that life has to offer. All forms of music accomplishes this through use of its own unique language, and authenticity is vital to the understanding of that language. David works hard to frame the art of music presentation in worship as intentionally as possible, understanding that the language is alive and breathing. He believes that as we inform the listener of any background or interpretation that is vital to the listening experience assists those participating. "Breaking down the walls of expectation and tradition, we explore any style or background of music if it has the potential to expand one’s perspectives and understandings of this beautiful life and world in which we live." David has been involved at Pine Street Church since 2007 and brings a lifetime of musical experience. From opera companies to rock bands and boy choirs to new music ensembles, David’s background includes both a bachelors and masters degrees in music performance. He feels strongly "that it is essential to his philosophy of music in the church, and is grateful to be on this path together with everyone out at Pine Street Church." Email David. Emily L’Hommedieu joined the PSC staff in the summer of 2012 and became our Preschool Director in 2015. She brings her experience as an elementary school music teacher and her masters in music education to us with a vision for children programming that is an inspiration to us all. Our newly renovated children’s area, along with our newly renovated preschool and School of Fine Arts provides our children and youth not only with a beautiful and inviting space, but we have some pretty amazing equipment: smart boards, iPads, Orff instruments, hand chimes, and more! Email Emily. Samãdhi is our lovely church dog. Her name means perpetual happiness and she clearly lives by it. She helps us greet our visitors and keep the building safe. She is trained therapy dog that goes around spreading love, joy and a little bit of hair to whoever she comes across. If you see her around say "Hi" and she will happily respond with lots of love. But watch out for that wagging tail. Originally from Northern Illinois, Justin Hoffenberg currently makes his home in Boulder, CO. Growing up in a musical household, he attended many concerts as a child and was drawn towards music. At 10 years old Justin joined his 5th grade orchestra, where he played the violin for one year before beginning Suzuki lessons, which he pursued until graduating high school. The summer between 5th and 6th grade proved a fateful one, as a family friend recommended attending the Rockygrass festival in Lyons, CO, as well as the camp that precedes it. Just ventured to the camp not knowing anything about Bluegrass, but was immensely changed by the experience. After spending the week with such fiddlers as Jason Carter (Del McCoury Band), Justin never looked back. He played in bluegrass bands from the time that he was 13; professionally since he was 15 years old. While a senior in high school, Justin helped form Long Road Home, the bluegrass band with which he is still playing full time. When not with Long Road Home, you can find him playing with a variety of projects, across a variety of genres. He’s been known to appear with his Rock and Roll band, The Bimarinal, and even at times as a guest eTone on the eTown radio show (where he appeared with such acts as the Indigo Girls, Tim O’Brien, Big Al Anderson and the North Mississippi All Stars). A performer dedicated to redefining cello playing, Phil Norman draws from diverse influences to create an eclectic and original sound. 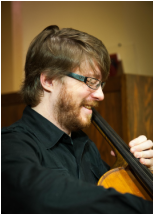 Classically trained with a degree from the University of Colorado, he has studied jazz with pianist Russell Schmidt and violinist Glenn Basham, and has since been immersed in alternative styles of cello playing. He is an active performer in the Front Range of Colorado, performing with Kristi Stice, Someone's in for an Explosion, Travis Grode and nationally with Bettman and Halpin. He has performed concerts in the United States, Italy, and Australia, has appeared on stage with composer and pianist, Carter Pann, guitarist Grant Gordy, and Bonnie Carol, and was a Featured Artist for TEDxBoulder.